Carbon Dioxide (CO2) is produced as a waste by-product of many industrial processes and is captured and repurposed (aka “Recycled CO2”) as a valuable resource for high-tech or high reliability product manufacturing applications. Liquid, solid, plasma, and supercritical CO2 are used to provide both stand-alone and tool-integrated precision cleaning, extraction, disinfection, modification, cooling, and lubrication functions. Moreover, CO2 technology works synergistically with innovative process adjuncts such as atmospheric plasma, Laser, and robotic automation to provide highly robust processing platforms. Effectively implemented, CO2 technology significantly reduces multiple forms of lean and green manufacturing wastes including factory space, labor, material inputs, processing time, energy, wastewater, and other non-productive by-products. Our company founder has pioneered the development of practical and effective CO2-based manufacturing solutions since 1984. Our experience comprises more than 30 years of CO2 technology and applications development, numerous commercial products and accessories, and a comprehensive and growing patent portfolio. Our proprietary products and processes utilize recycled CO2 as a precision cleaning spray, immersion cleaning and extraction solvent, surface modification agent, and machining coolant. 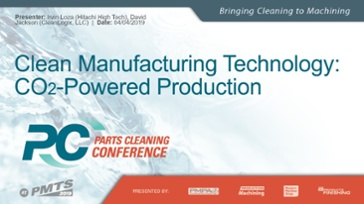 Our innovative clean manufacturing solutions address a variety of production cleaning, thermal control, and machining problems for high-tech and high-reliability product manufacturers. Our eco-friendly and highly adaptive CO2 solutions have solved a wide-range of contamination problems arising during the production of high-tech or high-reliability products in manufacturing industries such as Hard Disk Drive, Aerospace, Microelectronics, Medical, and Automotive. Our cleaning, cooling, and surface modification solutions are outstanding manufacturing sustainability tools for reducing manufacturing waste such as time, energy, labor, material, and space, while improving product manufacturing yields, quality, and productivity. David Jackson, Founder and President of CleanLogix LLC (CleanLogix), developed and patented the first dense phase CO2 processing technology at Hughes Aircraft in the 1980s to meet the stringent cleanliness requirements of hardware used in spacecraft and military systems. Mr. Jackson continued his pioneering work in CO2 technology during the 1990s with the development and commercialization of Centrifugal Liquid CO2 Immersion and CO2 Composite Spray technologies. 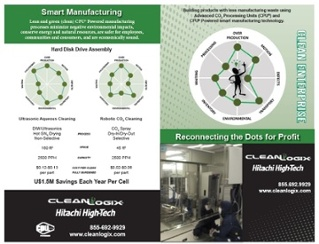 Since that early development period, CleanLogix has continued to innovate new and improved CO2 processing technology as well as evolve a business model that effectively addresses the numerous manufacturing market and application opportunities for CO2-based precision cleaning, cooling, and surface modification processes. CleanLogix provides OEMs, custom machine builders, and other value-added resellers with standardized CO2 process integration modules called a CO2 Processing Units (CPU®) under exclusive and non-exclusive market- and application-segmented licenses. Shown in the figure above, CPU® provide one or a combination of basic CO2 processing functions – cleaning, cooling, and surface modification – for a particular value-added manufacturing process and tool. CPU® incorporate our extensive experience, knowledge and patented technology for numerous manufacturing platforms including precision assembly, testing, robotic automation, hard machining, precision abrasive grinding, joining, among many other examples. CPU, CPU Powered, CO2 Processing Unit trademarks and technology protected under U.S. and International patents and pending patents and trademark law. CO2 Mechanics, by David Jackson. Based on more than 30 years of CO2 technology development and product commercialization, this guidebook provides manufacturing engineers and managers with practical knowledge, tools and techniques for developing and implementing innovative CO2-enabled lean and green (clean) manufacturing processes, products and production lines. Effectively implemented, CO2 technology is an outstanding manufacturing sustainability tool. CO2 technology significantly reduces multiple forms of lean and green manufacturing wastes including factory space, labor, material inputs, processing time, energy, wastewater, and other non-productive by-products. CO2 Composite Spray™ technology combines the cleaning (or cooling) power of microscopic crystals of solid carbon dioxide with patented coaxial jet spray cleaning processes to effectively remove contaminants (i.e., particles, thin films, heat) from the exterior or exposed surfaces of a product (or tool). CO2 Composite Spray™ cleaning technology mimics the chemistry, control, and performance characteristics of the tried-and-true fluorocarbon solvent spray processes of the past. The latest CO2 composite spray cleaning systems provide fluorocarbon-like spray chemistry, productivity and performance, and are equipped with a real-time photometric spray analysis technology for monitoring and maintaining the quality of the CO2 spray chemistry in-situ. These enabling aspects allow manufacturers to literally go back in time to unconstrain the precision cleaning process. With CO2 composite spray technology, manufacturing engineers can re-think and re-tool assembly operations previously designed and implemented around wet cleaning processes. For example, CO2 composite spray cleaning allows for increased complexity of the hardware (i.e., the presence of dissimilar materials and multiple components on an assembly) prior to cleaning which decreases the number of cleaning steps. Moreover, due to exceptional material and process compatibility, CO2 composite sprays can be used within a manufacturing tool or on the production line to provide pre-clean, clean-during, or post-clean processing capabilities. Shown in the figure above, a CO2 composite spray system comprises six integrated components: process fluids supply, CO2 spray generator, CO2 composite spray applicator, CO2 composite spray analyzer, process additives, and environmental control to manage airborne particles and surface cleaning effluents (contaminant aerosols). The CO2 composite spray cleaning process can meet a variety of cleanliness requirements, ranging from visually clean to more rigorous quality standards requiring sophisticated test methods such as Particle Counting, Non Volatile Residue (NVR) analysis, FTIR or Scanning Electron Microscopy (SEM). CO2 Composite Spray trademark and technology protected under U.S. and International patents and pending patents and trademark law. Centrifugal CO2™ immersion technology combines the solvent power of liquefied or supercritical carbon dioxide with patented bi-directional centrifugal cleaning action to effectively remove contaminants from the complex surfaces, both internal and external, of a product. Shown in the figure above, a centrifugal liquid CO2 system comprises two modules: a centrifugal cleaning module and the CO2 recycling module. The principle of operation is similar to a closed vapor degreasing system. Products to be cleaned are placed into the cleaning chamber and the lid is closed and sealed. The operator presses the start button on a graphical display console and clean liquid CO2 is automatically transferred from a supply vessel within the recycling system into the centrifugal cleaning chamber. During and following the fill cycle, the centrifugal liquid CO2 system cleans the products using bi-directional centrifugal agitation for a pre-determined cleaning cycle time. Following the centrifugal wash (or rinse) cycle, contaminant-laden liquid CO2 is transferred from the centrifugal cleaning system into the recycling system for phase separation and recovery operations. Clean, dry products are removed from the chamber and the cleaning process is complete. In the background, the recycling system separates contamination (or additives) from the liquid CO2 and is removed as a drag-out. The drag-out is captured and filtered for re-use or disposal and the recovered (purified) CO2 is transferred into the supply tank for reuse. The recycling module is capable of economically recovering 90%-95% of the CO2 for reuse. Moreover, the recycling module can operate in an off-line (batch mode) or in-line (continuous mode). CO2 is a solvent much like fluorinated solvents. As such, it will remove many but not all types of surface contaminants. Examples of contaminants which are soluble in liquid CO2 include hydrocarbon oils and silicone oils. Contaminants that are not particularly soluble in liquid CO2 alone can be solubilized by employing proprietary high boiling additives in the process. The centrifugal liquid CO2 immersion cleaning process can meet a variety of cleanliness requirements, ranging from visually clean to more rigorous quality standards requiring sophisticated test methods such as ASTM E595 TML and VCM, Non Volatile Residue (NVR) analysis, FTIR, or Scanning Electron Microscopy (SEM). Centrifugal CO2 trademark and technology protected under U.S. and International patents and pending patents and trademark law. Hitachi High Technologies (Singapore) is our exclusive global CO2 solutions provider using a worldwide base of value-added equipment and adjunct technology suppliers together with CleanLogix as expert CO2 solutions developer. As a team, we provide manufacturers of high-tech or high-reliability products with state-of-art, adaptable, and highly reliable CO2-based clean manufacturing solutions that deliver numerous benefits including water and energy use reductions, labor and space reductions, elimination of solvents, and no air pollution, while improving both manufacturing productivity and product quality.